Wednesday, July 6th, 2016, 6:30 p.m. 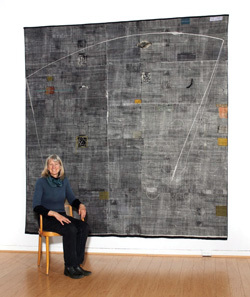 The Contemporary Textile Studio welcomes the renowned Canadian artist Dorothy Caldwell for an artist's talk about her work and practice on Wednesday, July 6, at the Textile Museum of Canada, Dorothy Caldwell’s talk illustrates how her textile art is an ongoing exploration of a sense of place. Her long time interest in marks humans make on the landscape creating patterns of settlement, agricultural practices and built heritage are translated onto cloth through dying, printing and stitching. Dorothy will tell the stories of her fieldwork in the Canadian Arctic, the Australian outback and rural Japan and India. By using materials collected in the field whether far away or close to home, the pieced, layered and stitched surfaces tangibly absorb and reflect her artistic journey.